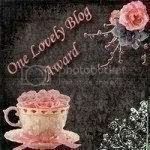 Thank you to the gorgeous Lucy for this lovely blog award! The idea of the "One Lovely Blog Award" is: Accept the award, post it on your blog together with the name of the person who has granted the award, and his or her blog link. Pass the award to up to 15 other blogs that you’ve newly discovered. Remember to contact the bloggers to let them know they have been chosen for this award. Don't feel like you have to do this, but I just wanted to let you know that I enjoy reading your blog! So thanks ladies for your lovely words... you always make my day a little brighter! Congratulations Zoey! And thank-you! I totally want to give the award back to you- because you're one of the few blogs that I search my reader for a new post from!! Wow! Thanks so much. I'm always surprised that anyone (other than my mum) reads my blog - let alone enjoys it!